This high quality all metal hand held slot punch is ideal for adding a slot to your ID badges, name tags and key cards. Equipped with a heavy duty spring and and easy to use punching mechanism this slot punch can be used to produce high quality slots in your laminated materials and in PVC badges that are up to 33mil thick. This slot punch produces a slot size that is 1/8" x 1/2" and does not include centering guides. The fact that it doesn't have centering guides makes this model more portable and less heavy than other models with centering guides. However, if you need to punch a large number of items, the centering guides may come in handy. Welcome to MyBinding video. This is the hand held slot punch, specifically for punching holes for lanyards and badge rails. It can punch through projects up to 33mil thick. The thicker your project, the more difficult it is to punch. It is good to make sure that your projects are flushed. Having the handheld punch with the guide helps with this and makes a whole that is 1/8” x ½”. You can stamp just about anything that will fit into the slot from the device. The hole fits most, if not all, lanyard clips, which means you can make your own name badges. It’s built of solid metal and is incredibly sturdy. For its size, it’s quite heavy and there’s no worry of any injury while using it. For more demos, reviews and how-to’s, go to MyBinding.com. More and more offices are using name badges and key cards, which is also increasing the need for slot punches. One great tool for this is the Hand Held Slot Punch. With high quality, all metal design, this is a professional heavy duty device excellent for use in any office. It reliably produces industry standard slots ideal for name tags, ID badges, and key cards. Here is a closer look at the details of this handy little device. The lightweight and compact design make this slot punch incredibly convenient. For personal use, it can easily store in or on your desk. Or you could keep one in a general office supply cabinet for shared use. And since it weighs less than two pounds, it's easily carried to wherever punching is needed. 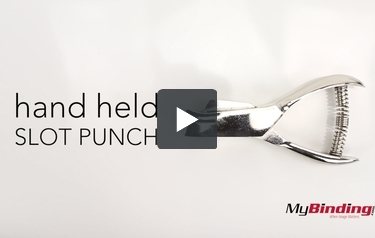 This punch is designed for hand held use. This is especially convenient for on-the-go punching, such as you might find at an outdoor concert venue. Since a solid surface isn't needed for use, this slot punch can be used anywhere. Solid steel construction provides strong leverage while still being easy to use. A heavy duty spring allows the punch to swiftly pop back out of the the punched material and keeps the device from jamming.